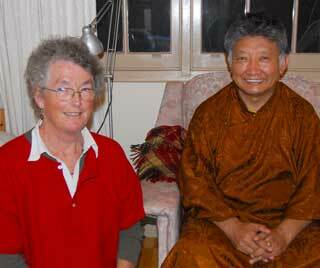 Jacqui's interview with Lama Choedak Rinpoche, Sydney May 2009. Lama Choedak Rinpoche, is the founder and Spiritual Director of Sakya Losal Choe Dzong, Rongton Buddhist College and Virupa Retreat Centre in Canberra. He is also Spiritual Director of the Sakya Jamchen Buddhist Centre in Melbourne, as well as at least 20 centres around Australia and New Zealand and has helped design teaching programs for many other Tibetan Buddhist centers in Malaysia, USA, Singapore, Australia and New Zealand. In this (hour long) interview Choedak Rinpoche has a number of somewhat controversial things to say about pereived limitations of both the Eastern Asian monastic model of Buddhism and the weaknesses and strengths of Western societies and their reception of Buddhadharma, meditation practice and spiritual rituals. For example, he believes that the Asian monastic model, oriented around monks, nuns and elaborate traditional rituals, "scares people away." On the other hand, he also feels that Westerners are often too materialistic and academically oriented in their studies of Buddhism, focussing on reading books and marvelling reverently at the exotic nature of Tibetan monasteries, temples and rituals instead of focussing on the spiritual experiential practice that they need in order to provide real benefit and understanding. He notes how most Westerners with a Judeo-Christian background "try too hard" to get their practice "right", expressing their impatience to be "enlightened" but miss the point that the real purpose is to help people and bring more love, compassion, joy and equanimity into their daily lives, relationships and behaviours. He sees "lots of intellectual Buddhism" and calls for Westerners, and others caught in Westernised ideas and materialism, to "move from head to heart!" Speaking as one of the main translators of Tibetan and Sanskrit texts, Lama Choedak outlines some of the difficulties associated with bridging cultural differences and achieving consistent interpretations without any formal standardisation guidelines. This is particularly problematic when encountering the individualistic and proprietorial orientation of Western academic practice. Similarly, when comparing Buddhist psychology with Western psychologies, he is concerned at the Western tendency to talk in terms of "conditions" and fixed causes, usually seen as historically based on some perceived trauma, noting how perception of diagnosed "conditions" is problematic in the light of the Buddhist conceptions of impermanence and interdependence of all phenomena. Again, he sees too much emphasis on theories and behaviorist studies and too little experiential practice, examining and calming the mind, amongst both psychotherapists and their clients. In conclusion, he recognises that there is a lot of spiritual seeking and enthusiasm in the West but cautions that the high level of education and access to books In Western industrialised countries may be rushing the necessary period of East/West enculturation, causing "premature adaptation" and over-simplification of the teachings that have been developed in Eastern Asian cultures.